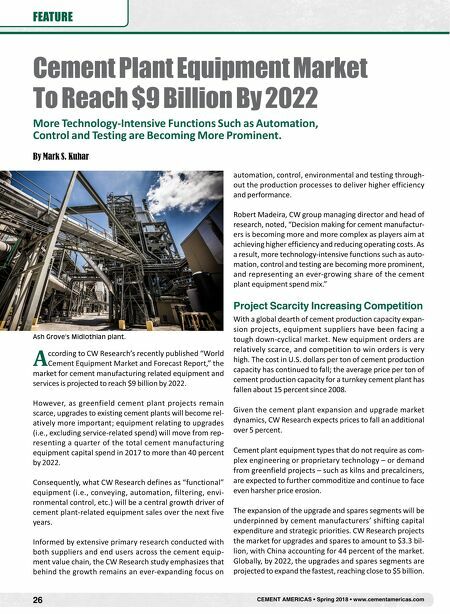 26 CEMENT AMERICAS • Spring 2018 • www.cementamericas.com FEATURE A ccording to CW Research's recently published "World Cement Equipment Market and Forecast Report," the market for cement manufacturing related equipment and services is projected to reach $9 billion by 2022. However, as greenfield cement plant projects remain scarce, upgrades to existing cement plants will become rel- atively more important; equipment relating to upgrades (i.e., excluding service-related spend) will move from rep- resenting a quarter of the total cement manufacturing equipment capital spend in 2017 to more than 40 percent by 2022. Consequently, what CW Research defines as "functional" equipment (i.e., conveying, automation, filtering, envi- ronmental control, etc.) will be a central growth driver of cement plant-related equipment sales over the next five years. Informed by extensive primary research conducted with both suppliers and end users across the cement equip- ment value chain, the CW Research study emphasizes that behind the growth remains an ever-expanding focus on automation, control, environmental and testing through- out the production processes to deliver higher efficiency and performance. Robert Madeira, CW group managing director and head of research, noted, "Decision making for cement manufactur- ers is becoming more and more complex as players aim at achieving higher efficiency and reducing operating costs. As a result, more technology-intensive functions such as auto- mation, control and testing are becoming more prominent, and representing an ever-growing share of the cement plant equipment spend mix." Project Scarcity Increasing Competition With a global dearth of cement production capacity expan- sion projects, equipment suppliers have been facing a tough down-cyclical market. New equipment orders are relatively scarce, and competition to win orders is very high. The cost in U.S. dollars per ton of cement production capacity has continued to fall; the average price per ton of cement production capacity for a turnkey cement plant has fallen about 15 percent since 2008. Given the cement plant expansion and upgrade market dynamics, CW Research expects prices to fall an additional over 5 percent. 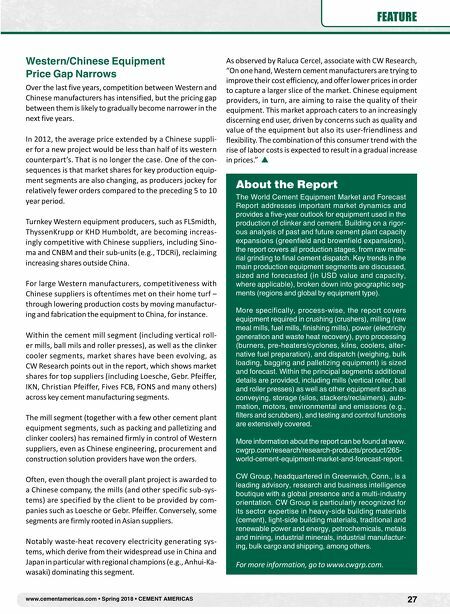 Cement plant equipment types that do not require as com- plex engineering or proprietary technology – or demand from greenfield projects – such as kilns and precalciners, are expected to further commoditize and continue to face even harsher price erosion. The expansion of the upgrade and spares segments will be underpinned by cement manufacturers' shifting capital expenditure and strategic priorities. CW Research projects the market for upgrades and spares to amount to $3.3 bil- lion, with China accounting for 44 percent of the market. Globally, by 2022, the upgrades and spares segments are projected to expand the fastest, reaching close to $5 billion. Cement Plant Equipment Market To Reach $9 Billion By 2022 More Technology-Intensive Functions Such as Automation, Control and Testing are Becoming More Prominent. By Mark S. Kuhar Ash Grove's Midlothian plant.